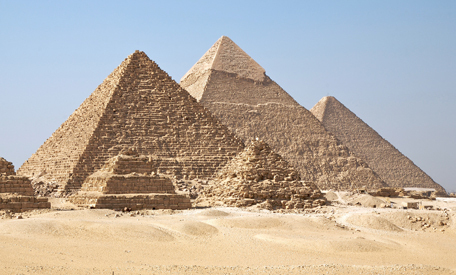 The oldest, most famous and only surviving wonder of antiquity is the Great Pyramid of Giza. Erected during the reign of the Pharaoh Khufu, its 2.5 million limestone blocks cover 13 acres and stand 454 feet high. The Great Pyramid is a marvel of engineering for its precision, and for the techniques that would have been required to raise its blocks, which weigh between two and 70 tons each. “The Hanging Gardens of Babylon” might be a misnomer. Originally believed to be built by King Nebuchadnezzar II in Babylon, recent scholarship suggests the gardens were built by King Sennacherib in the city of Nineveh. The structure of the gardens and their location have been a source of great debate among archaeologists. Due to the fact that no physical evidence of the gardens remains, all that can be learned about them must be gleaned from historical accounts. Nearly 400 feet in length and made entirely of marble—the first temple of its kind—the Temple of Artemis would have been a marvelous sight. It was designed by the Greek architect Chersiphron and funded by the wealthy king Croesus of Lydia. Artemis was the twin brother of Apollo, the virgin goddess of the hunt. The temple took 120 years to complete, according to Roman historian Pliny the Elder. An Ionic temple, each of its 127 columns was capped by a twin scroll-shaped sculptural flourish. The temple was destroyed by Herostratus in 356 B.C., then rebuilt, and again destroyed in 262 A.D. by the Goths. Today all that remains of the temple is a single column. After finishing his work at the Acropolis, Athenian artist Pheidias was commissioned by the Olympian priesthood to sculpt a statue of Zeus, the king of the gods, at the Temple of Zeus in Olympia. Pheidias’s 12 years of labor resulted in a magnificent work, nearly 40 feet high, that sat in the naos of the temple for nearly 800 years. But the statue didn’t survive into the modern era, so scholars rely on historical accounts of the statue for insight into its appearance. Pausanias, a Greek geographer, described the statue at length. Mausolus was a tyrant of Caria in southwestern Asia Minor. Upon his death, Mausolus’ widow Artemisia succeeded him and had a monumental tomb erected in his honor by the architect Pythius in the capital city Halicarnassus. The tomb was lavishly adorned with sculptures by Greek artists Scopas, Bryaxis, Leochares and Timotheus. Reliefs depicted the famous battle of Amazonomachybetween the Greeks and Amazons. Pliny the Elder described the mausoleum as being nearly square. “It was bounded by 36 columns, and the top formed a 24-step pyramid surmounted by a four-horse marble chariot.” It was constructed of bricks, but faced with white Proconnesian marble that would have created a dramatic effect. It is believed that the mausoleum was destroyed by an earthquake sometime between the 11th and 15th centuries A.D., and its ruins recycled in other local buildings. Carved by Chares of Lindos, the Colossus of Rhodes lorded over the Greek island of Rhodes in the Aegean Sea for seven decades. It was a 120-foot statue standing atop a 25-foot high plinth of marble. The statue was constructed to honor Helios, the sun god. As years passed and the Colossus became myth, artist depictions commonly surfaced showing the statue straddling the harbor in Rhodes. Historians debate the exact place where the statue would have stood, though consensus says it didn’t straddle the harbor. The Lighthouse of Alexandria stood on the island of Pharos in the harbor of Alexandria. At a height of more than 350 feet, the building was a marvel of engineering and a sublime monument that would become the model for all lighthouses to come after it. It was built by Sostratus of Cnidus in “three stages, all sloping slightly inward; the lowest was square, the next octagonal, and the top cylindrical. A broad spiral ramp led to the top, where a fire burned at night.” By some descriptions the structure was topped with a large statue representing Alexander the Great or Ptolemy I Soter, the Greek general under Alexander the Great who became ruler of Egypt in the late fourth century B.C. The lighthouse was destroyed by an earthquake in the 1300s, and its ruins were converted into a fort in 1477 by the Mamluk sultan Qa’it Bay. An archaeological survey of the waters surrounding Pharos in 1994 revealed the presence of large stones and statues once adorning the lighthouse. It first appeared on “seven wonders” lists in the sixth century A.D., replacing the Walls of Babylon. This article was originally written by James Sullivan; it was updated on May 31, 2017.